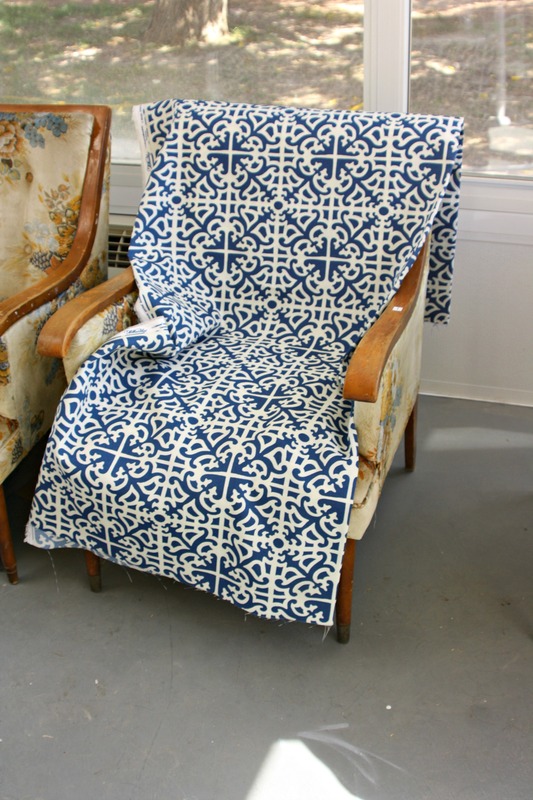 Please ignore the dirty grey floors, these were taken in my sunroom which is patiently awaiting a makeover. Alongwith the rest of the house. I love their shape, and their size, they are compact but big enough to hold a large-ish girl like myself. Granted, they aren’t the type of chairs you really want to curl up in and read War and Peace. They seem to have a slight whoopie cushion quality to them, but minus the rude sound. And were pretty dirty when I brought them home from Goodwill. Source was Pinterest, which was originally pinned by another user from a Craigslist posting. Sorry, I tried to find a better and more linkable example but this one was too perfect. 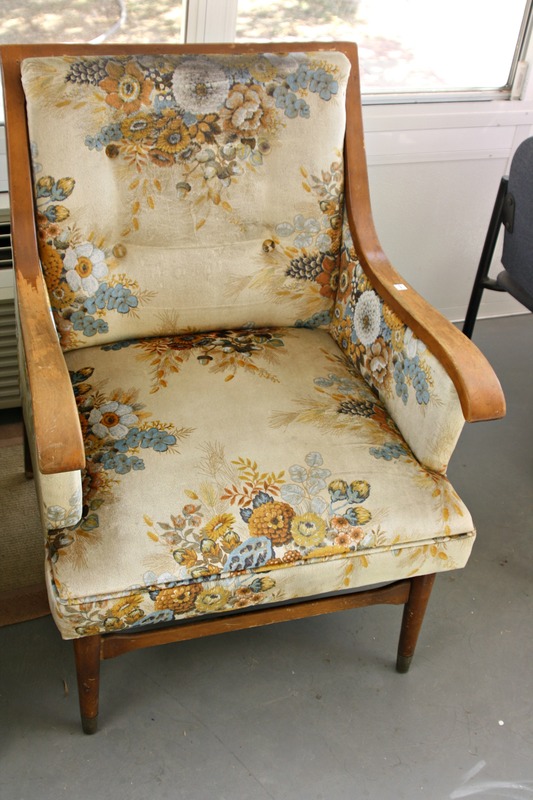 The current upholstery is a floral velour that has seen better days, the print is pretty and I am sure the fabric was nice when it was new in 1971, but I’m still not sold on it. Since the current upholstery is kind of shedding and isn’t quite my cup of tea, I played around with some upholstery fabric I had laying around. I love the boldness, but it may be too bold and too much of a statement to be able to be used in other rooms. I’ve got some white upholstery grade fabric that might work well, but with two dogs in the house that shed and get on the furniture, I’m a bit hesitant to use it. Any piece in my house needs to be able to take a beating, and tolerate two shedding dogs. So after a year, I’m still stuck on what to do with these guys. Maybe they just aren’t my style at all, or maybe the whoopie cushion-ness of them makes them too uncomfortable for me to even want to keep them. But since they were so cheap, 9.99 each, the cheapskate in me doesn’t want to let them go. The Nester preaches against having fear when it comes to decorating or even re-doing furniture. Afterall, she states that it doesn’t have to be perfect to be beautiful. Oh, how right she is, maybe I will finally take the plunge and do something creative with my chair twins. 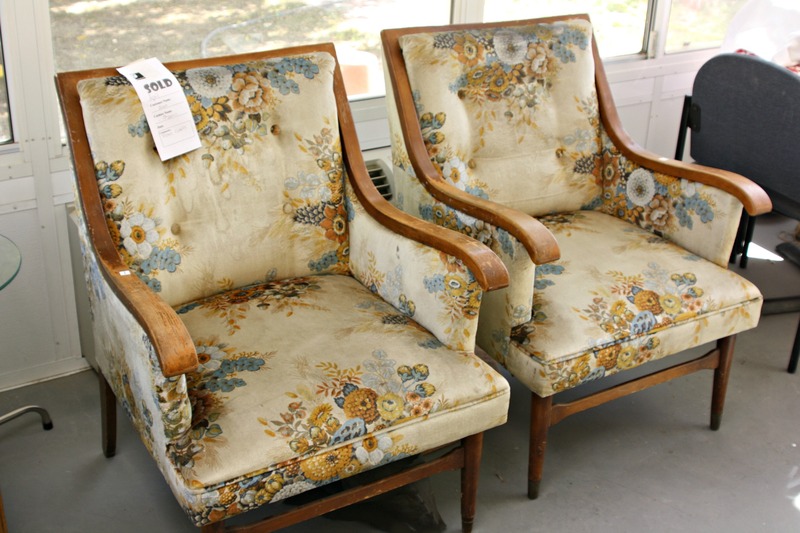 What would you do if you had these chair twins in your possession? Would you reupholster them? Paint them? Or simply clean them up and enjoy their vintage quality?